Call The Aerial Guys today on 01942 669043 for a no obligation estimate and to arrange an appointment. If you live in Wigan and are looking for local TV or satellite installation and repair experts, then call The Aerial Guys. We are passionate about providing you with the best possible service. Contact us today on 01942 669043 to book an appointment. 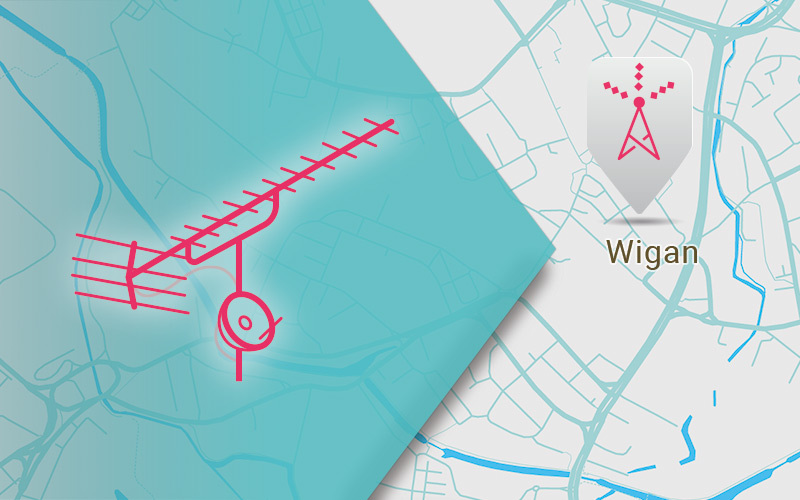 If you want a complete satellite installation in Wigan, then we’ve got it all. The Aerial Guys are fully trained to set-up everything in your system – from fitting your satellite dish, to configuring your set-top box and sorting out all the wires and cabling. At The Aerial Guys, we specialise in all the main satellite services, including Sky, Freesat and European satellite installations. Call us today on 01942 669043. Is your satellite signal scrambled or your pictures pixelated? Then don’t despair, because The Aerial Guys are here to help. Our fully trained team perform full satellite repairs in Wigan and the surrounding area. Our professional engineers permanently carry a wide range of equipment, suitable for all the leading satellite brands, which means that we can often fix your viewing issue on the day you call us out. So, if you’re in the Wigan area, and need a local satellite repair service, speak to The Aerial Guys today on 01942 669043. The Aerial Guys have carried out countless TV aerial installations in Wigan over the years. And, unlike some of the larger, less approachable companies, at The Aerial Guys we really do give you a one-to-one local service that you can trust. So, whether you need Wigan aerials, or you’re thinking of installing a whole new TV setup, at The Aerial Guys we are always ready to come over and sort out your TV viewing requirements – whenever and wherever you need us. Our friendly and efficient aerial installers will initially assess your TV aerial requirements before presenting you with a fixed price, upfront quote there and then – before any work can start. With a diverse and far-reaching network of engineers, working right across the North of England, The Aerial Guys can usually ensure an expert engineer visits your Wigan home the very same day. So why not speak to one of our technical advisers today on to 01942 669043 to find out how easy it is to arrange a visit from your local Wigan engineer. “Our satellite system was brand new. I treated the family after a bit of extra money came my way. I’d gone to one of the top companies too, so I wasn’t expecting it to fail. I tried everything to get it up and running but the TV just didn’t want to connect. We were all so disappointed. Especially our youngest daughter, as she’d told all her friends we had all the channels now. It was heart-breaking to see her face,” he says. Gavin called The Aerial Guys and explained the issue to one of our technical advisers. An engineer was dispatched almost immediately. “I wasn’t in when the engineer came around, but my wife told me how patient and courteous he was. He managed to locate the problem quite quickly. It turned out we had a part missing but luckily he had it in stock in his van and was soon able to sort out the issue. The whole system is running perfectly now. “You should have seen my daughter’s face when she got back from school. She’s having a sleepover with her friends, so they can make the most of all the movie channels we’ve got now. This just wouldn’t have been possible without The Aerial Guys. What a great team they have there!” Gavin says.